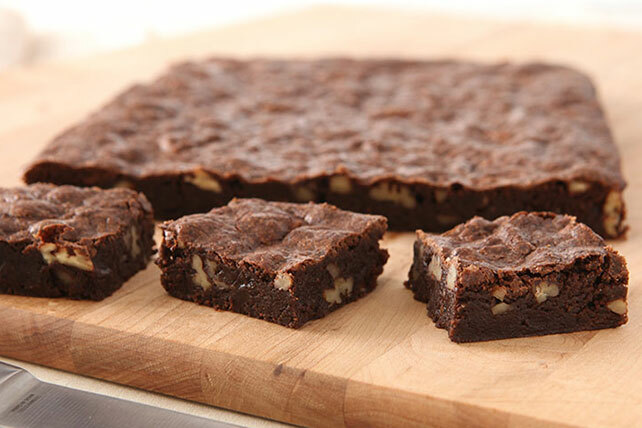 Mocha fans, these brownies are calling your name! The chocolatey treats get a hint of espresso for the ultimate mocha taste. Mix coffee grounds and water. Microwave chocolate and butter in large microwaveable bowl on HIGH 2 min. or until butter is melted; stir until chocolate is completely melted. Stir in sugar. Blend in coffee, eggs and vanilla. Add flour and nuts; mix well. Pour into prepared pan. Bake 30 to 32 min. or until toothpick inserted in center comes out with fudgy crumbs. (Do not overbake.) Cool completely. Use foil handles to remove brownies from pan before cutting to serve. Melt chocolate and butter in large saucepan on very low heat, stirring constantly. Remove from heat. Stir in sugar, then continue as directed.